Welcome to Aero Web Tech! Integration with proprietary data systems and services delivered by JETNET LLC and the Aviation Business Index (ABI). Note that Aero Web Tech is the Exclusive Technology Solution Partner for JETNET LLC. The Quarterly Newsletter of Vref - For People Who Demand Accuracy, And Know the Difference! ABI is the leading source of aircraft for sale by dealers on the web. Along with aircraft for sale, the site provides dealer wanteds, aviation news, resources, and events. 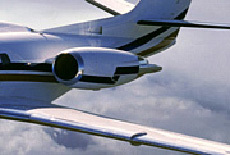 Check out ABI at www.aviationbusinessindex.com. As part of this partnership, Aero Web Tech has the advantage of exclusive and transparent access to JETNET's one of a kind aviation data services (assuming customer subscriptions to JETNET service). In addition, AWT can integrate data from JETNET within proprietary customer solutions with the security and integrity that that aviation industry clients demand for their proprietary information. Our staff have worked directly with JETNET for over 10 years designing, developing, supporting JETNET's state-of-the-art Internet solutions.